The Red Queen HypothesisIt is not in dispute that sexual reproduction provides evolutionary advantages to organisms that employ this mechanism to produce offspring. But why, even in the face of fairly stable conditions, does sexual reproduction persist when it is more difficult and costly for individual organisms? Variation is the outcome of sexual reproduction, but why are ongoing variations necessary? Enter the Red Queen hypothesis, first proposed by Leigh Van Valen in 1973.1 The concept was named in reference to the Red Queen’s race in Lewis Carroll’s book, Through the Looking-Glass. Fertilization and meiosis alternate in sexual life cycles. What happens between these two events depends on the organism. The process of meiosis reduces the chromosome number by half. Fertilization, the joining of two haploid gametes, restores the diploid condition. There are three main categories of life cycles in multicellular organisms: diploid-dominant, in which the multicellular diploid stage is the most obvious life stage, such as with most animals including humans; haploid-dominant, in which the multicellular haploid stage is the most obvious life stage, such as with all fungi and some algae; and alternation of generations, in which the two stages are apparent to different degrees depending on the group, as with plants and some algae. Nearly all animals employ a diploid-dominant life-cycle strategy in which the only haploid cells produced by the organism are the gametes. Early in the development of the embryo, specialized diploid cells, called germ cells, are produced within the gonads, such as the testes and ovaries. Germ cells are capable of mitosis to perpetuate the cell line and meiosis to produce gametes. Once the haploid gametes are formed, they lose the ability to divide again. There is no multicellular haploid life stage. Fertilization occurs with the fusion of two gametes, usually from different individuals, restoring the diploid state ([link]). 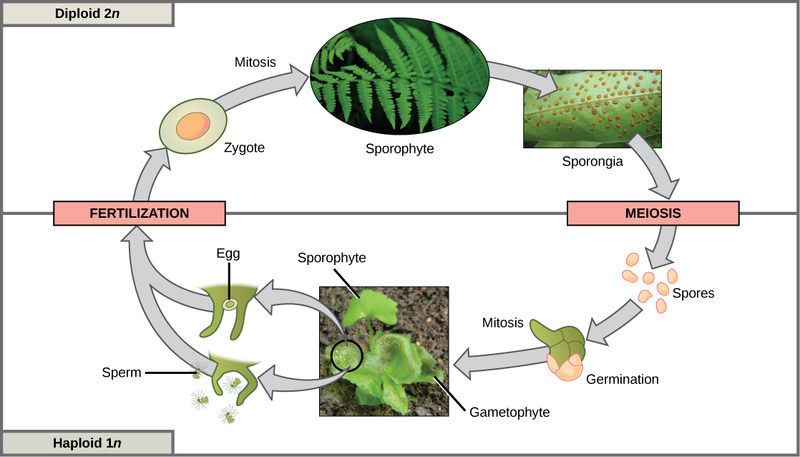 Most fungi and algae employ a life-cycle type in which the “body” of the organism—the ecologically important part of the life cycle—is haploid. The haploid cells that make up the tissues of the dominant multicellular stage are formed by mitosis. During sexual reproduction, specialized haploid cells from two individuals, designated the (+) and (−) mating types, join to form a diploid zygote. The zygote immediately undergoes meiosis to form four haploid cells called spores. Although haploid like the “parents,” these spores contain a new genetic combination from two parents. The spores can remain dormant for various time periods. Eventually, when conditions are conducive, the spores form multicellular haploid structures by many rounds of mitosis ([link]). The third life-cycle type, employed by some algae and all plants, is a blend of the haploid-dominant and diploid-dominant extremes. Species with alternation of generations have both haploid and diploid multicellular organisms as part of their life cycle. The haploid multicellular plants are called gametophytes, because they produce gametes from specialized cells. Meiosis is not directly involved in the production of gametes in this case, because the organism that produces the gametes is already a haploid. Fertilization between the gametes forms a diploid zygote. The zygote will undergo many rounds of mitosis and give rise to a diploid multicellular plant called a sporophyte. Specialized cells of the sporophyte will undergo meiosis and produce haploid spores. The spores will subsequently develop into the gametophytes ([link]). Nearly all eukaryotes undergo sexual reproduction. The variation introduced into the reproductive cells by meiosis appears to be one of the advantages of sexual reproduction that has made it so successful. 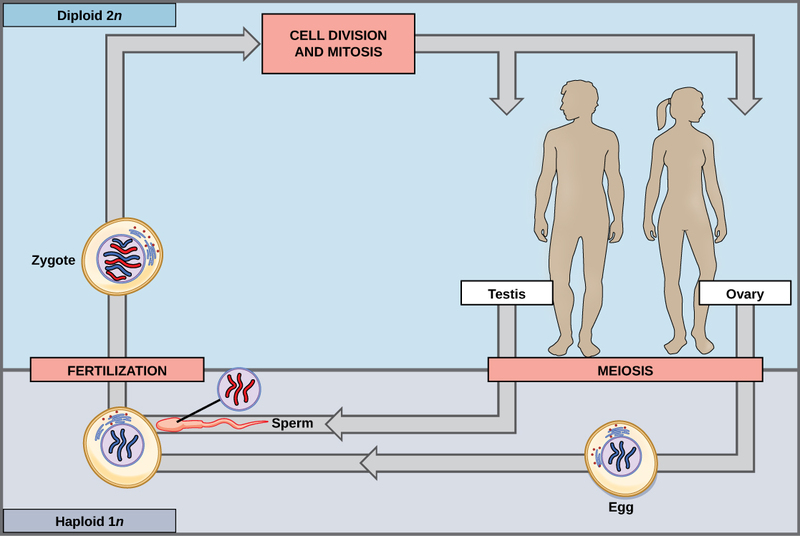 Meiosis and fertilization alternate in sexual life cycles. The process of meiosis produces unique reproductive cells called gametes, which have half the number of chromosomes as the parent cell. Fertilization, the fusion of haploid gametes from two individuals, restores the diploid condition. Thus, sexually reproducing organisms alternate between haploid and diploid stages. However, the ways in which reproductive cells are produced and the timing between meiosis and fertilization vary greatly. There are three main categories of life cycles: diploid-dominant, demonstrated by most animals; haploid-dominant, demonstrated by all fungi and some algae; and the alternation of generations, demonstrated by plants and some algae. [link] If a mutation occurs so that a fungus is no longer able to produce a minus mating type, will it still be able to reproduce? [link] Yes, it will be able to reproduce asexually. Sexual reproduction involves fewer steps. There is a lower chance of using up the resources in a given environment. Sexual reproduction results in variation in the offspring. Sexual reproduction is more cost-effective. Fungi typically display which type of life cycle? A diploid, multicellular life-cycle stage that gives rise to haploid cells by meiosis is called a ________. List and briefly describe the three processes that lead to variation in offspring with the same parents. a. Crossover occurs in prophase I between non-sister homologous chromosomes. Segments of DNA are exchanged between maternally derived and paternally derived chromosomes, and new gene combinations are formed. b. Random alignment during metaphase I leads to gametes that have a mixture of maternal and paternal chromosomes. c. Fertilization is random, in that any two gametes can fuse. Compare the three main types of life cycles in multicellular organisms and give an example of an organism that employs each. a. In the haploid-dominant life cycle, the multicellular stage is haploid. The diploid stage is a spore that undergoes meiosis to produce cells that will divide mitotically to produce new multicellular organisms. Fungi have a haploid-dominant life cycle. b. In the diploid-dominant life cycle, the most visible or largest multicellular stage is diploid. The haploid stage is usually reduced to a single cell type, such as a gamete or spore. Animals, such as humans, have a diploid-dominant life cycle. c. In the alternation of generations life cycle, there are both haploid and diploid multicellular stages, although the haploid stage may be completely retained by the diploid stage. Plants have a life cycle with alternation of generations. Sexual Reproduction by OpenStaxCollege is licensed under a Creative Commons Attribution 4.0 International License, except where otherwise noted.